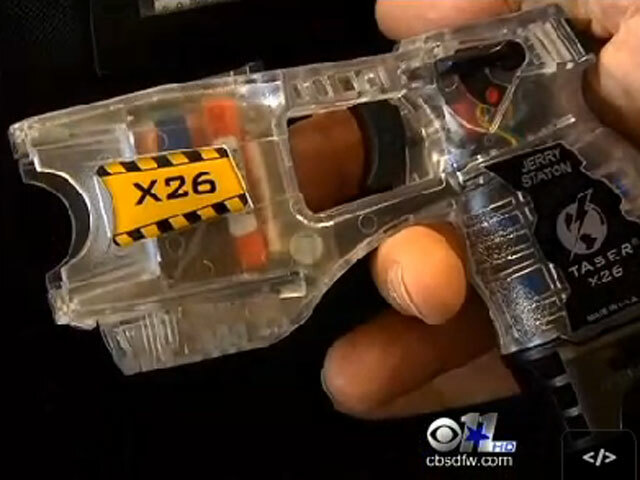 (CBS) MANSFIELD, Texas - Five North Texas police departments have discontinued the use of all Taser guns, citing a new manufacturer's warning, and concerns about lawsuits, CBS DFW reports. The station says police in five small cities in the Dallas- Fort Worth area are reacting to a warning posted on the website of Taser International, which states, "any use force, including the use of a CEW (conducted electrical weapon), involves risks that a person may get hurt or die." Police departments in Mansfield, Richland Hills, Crowley, Murphy and Burleson have all changed their stun gun policies, after dozens of lawsuits nationwide were filed this year involving Tasers, according to CBS DFW. The station reports that in Mansfield, the decision to discontinue the use of Tasers was made by Chief of Police Gary L. Fowler after reviewing recommendations provided to the department by general counsel for the city. Most of the lawsuits filed, according to attorney and peace officer Pete Schulte, are filed against the city involved in the incident, the police department and officer involved and Taser International, which makes the stun guns. "One lawsuit could really tax the ability of these smaller cities to run their police departments," Schulte told the station. He said most larger police departments say "there has to be active aggression" by an individual to justify Taser use by an officer in response.